I have all of the details of the DIY projects as well as how we decorated and made much our baby girl's restful pink and gray nursery décor ourselves on this page including pictures, shopping resources, brand names and colors for the paint and all the items that were used in decorating Sophia's nursery. More examples of pink and gray nursery decor. However, I regret to say that the store where we bought the decoration that most contributes to the peaceful, tranquil atmosphere of the room, including the Cherry Tree wall decals with the pink flowers that I feel made such a wonderful impact on the space, is no longer in operation. Go here to see more . and find many of the elements that went into this project that are no longer available in other stores. 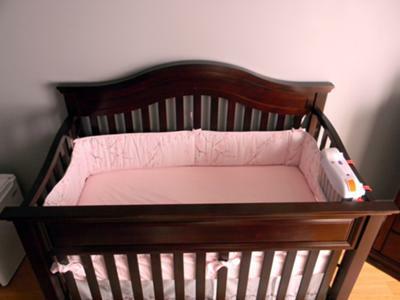 Wall Paint Colors: The gray paint color provides a soft background for our baby girl's pink baby bedding. The colors we chose are Valspar Signature "Simple Gray" and "City Storm", both of which are available at Lowe's home improvement center. Sophia's crib, changing table and dresser are from the Savanna Tori collection available at JC Penney. Both the nursery rocker and ottoman were bought at Target. 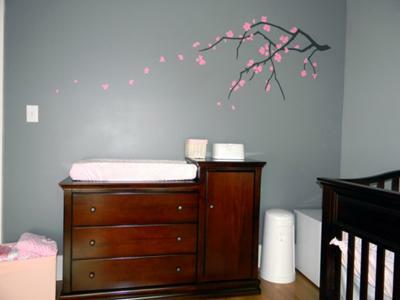 The cherry blossom wall decal came from Thenext.com but we recently found that this website is no longer functional. Sophia's baby bedding set is called European Cherry Blossom. 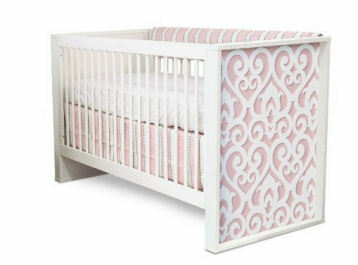 Both her crib set and her nursery curtains came from Restoration Hardware Baby. We bought the letter decals that spell SOPHIA and the nursery rug from Pottery Barn Kids. The artwork on the walls and the floor baskets that I plan to use for additional storage all came from IKEA. If you have any questions about any of the decorations or products in the list that went into the creation of Sophia's restful pink and gray nursery decor, please leave a comment! Thanks to Unique Baby Gear Ideas for hosting the baby nursery pictures contest. Barbara, thanks so much for sharing your restful nursery decorating ideas with us! I love your choice of color for the nursery walls. 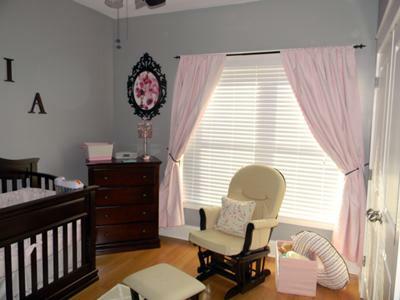 The gray and pink nursery colors that you chose complement each other beautifully. What brand are the pink curtains? I'm looking for blackout, room darkening curtains, but I'm having trouble finding them in a light pink color. I liked this theme very much and I want to implement many of your tips in my baby’s nursery. Thank you for sharing Sophia's serene nursery design. I love the peaceful, serene atmosphere in your baby's room. Thank you for sharing your paint colors and details so that I can do something similar. Thank you! You are right that Simply Gray is the color for 3 of the walls and the wall with the cherry blossoms has the darker color. It's actually hard to tell a difference at all in the colors, but that's likely due to the lighting of our room. If I knew it wouldn't be that noticeable we would have saved the time and expense and just gone with simply gray. Good luck and congrats! This room is beautiful. I'm also trying to choose between two different colors of gray...I was wondering if you meant "simply gray" by valspar? Also did you paint one wall the other color mentioned, or are all 4 walls the valspar simple gray? Thanks! Hi! The furniture color is espresso and we've been pretty happy with it. Some of the drawers need some extra oomph sometimes to get them to close (I think they get off the runners) but all in all a good value. Thanks to everyone for the kind comments. It's been a great space for our little one. I am looking at the same furniture set for my baby boy. I was wondering what color the furniture was... cherry or espresso? Thanks for you help. The nursery is really beautiful! I wish I would've thought of this for my baby girl! Your baby girl's pink and gray nursery seems so relaxing and restful in the photos. I can only imagine how lovely it must be in person.